Built by Nakajima during May 1939. True Serial Number 353. Estimated date of assembly was late May 1939. Delivered to the Imperial Japanese Navy (IJN). Assigned to the 553 Kōkūtai with tail number 53-305. This aircraft operated from Kataoka Airfield on Shumushu Island in the Kurle Islands. During October 1944, redesignated Hokuto Kōkūtai and the tail number changed to H-305. During the Japanese defense of the Philippines in late 1944, the entire Hokuto Kōkūtai and moved south, leaving only four Kates and one Jill behind at Kataoka Airfield to defend the area. On August 10, 1945 when Soviet forces attacked Shumushu Island, this and the other remaining Kates attacked Lopatka Point on the southern tip of the Kamchatka Peninsula. Japan officially surrendered on August 15, 1945. On August 17, 1945 Soviet aircraft bombed Shumushu. In retaliation, the remaining Kates were reportedly took off on a mission to attack a Soviet Convoy off Lopatka Point, and claimed a minesweeper as sunk. On August 21, 1945 a localized cease fire ended the fighting. This aircraft was abandoned on Shumushu. Over the years, it was gradually broken up with a gas torch, and scrapped. The center section with a portion of each wing remained until 2003. Everything forward of the cockpit was missing. During 2003, the center section was recovered by the Hunt brothers, after negotiation with the Russian government for recovery the pair cut up the wreckage and salvaged, transporting it back to the United Kingdom. 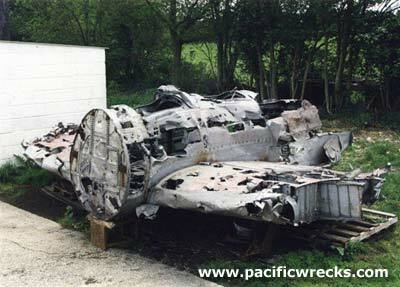 During 2004, the wreckage was offred for sale as a restorable airframe. But with so few parts available, and general lack of interest in Japanese aircraft, it was not sold. One identification tag, on the port undercarriage had manufacture number '5353', which would make the aircraft a B5N2 Kate. A data plate from a fuel tank reads "474" associated with B5N1 Kate 474 built during 1939. This fuel tank must have been fitted as a replacement part into this aircraft at some stage in the war. As of April 2009, dispayed in a diorama "Ghosts of the Tundra Display" at the Wings Museum, owned by the Hunt brothers. FlyPast "World's Only Nakajima Kate Arrives in UK", by Giuseppe Picarella in June 2004 about this aircraft.